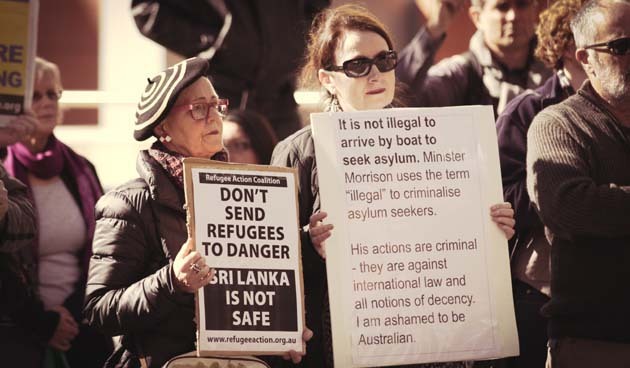 Refugee rights activists have stepped up anti-deportation actions as the government tries to send back a growing number of asylum seekers to countries like Sri Lanka, Afghanistan and China. In December, for the first time, action by passengers on an Air China Flight from Sydney successfully prevented the deportation of an asylum seeker. Some asylum seekers, like those from Iran, cannot be sent back because their governments will not accept forced deportations. But there a large number of asylum seekers who have exhausted all their appeal avenues and have nothing preventing them from being deported. “There were a few RAC members at the airport handing out flyers and we had a chat about the situation. They let us know the asylum seeker was on the plane and encouraged people to do what they can to protest against that forced deportation. “When we were getting onto the plane and everyone was getting settled, the asylum seeker ran up the aisle of the plane and had two Serco guards chasing after him shouting ‘Stop that man’. He was right at the back of the plane in the very back seat so we didn’t notice him before he did that. “They dragged him back to his seat and as they did, he had his hands in the air. You could see the shackles around his wrists. He had a mask on his face that he pulled down saying, ‘this is how they treat people, this is what they’re doing to me’. “Me and several others on the flight got up and spoke to the flight attendant, because a lot of people had concerns about safety and security on the flight after that. Eventually an official from Sydney airport came onto the plane. I told her I wasn’t going to sit down until he was taken off. The transfer of an asylum seeker from Melbourne in early February was also disrupted when a number of passengers stood up and protested on the flight. Although the protesters were forced off the plane, the 25-year-old Tamil asylum seeker, Puvaneethan, was also removed from the flight and kept in Melbourne. He had been scheduled for a move to Darwin as a step towards deportation to Sri Lanka. Activists were concerned that this would separate him from legal support and friends in the community. Anti-deportation actions, including the disruption of flights, will not be able to stop every deportation. A Tamil asylum seeker was successfully deported from Sydney in January despite similar efforts by activists to leaflet the airport. But the threat of disruption, as well as campaigns designed to shame airlines that facilitate deportations can build up pressure over the long term. We can start by targeting Malaysia Airlines, Air China and Thai Airways. All have taken deportees in recent months. Ultimately we need to convince airline unions to help stop deportations through industrial bans at the airport. This has worked in the past. In 1998 action by the Transport Workers Union in Perth stopped the deportation of a Somali asylum seeker after requests from Amnesty and the UN Committee on Torture.